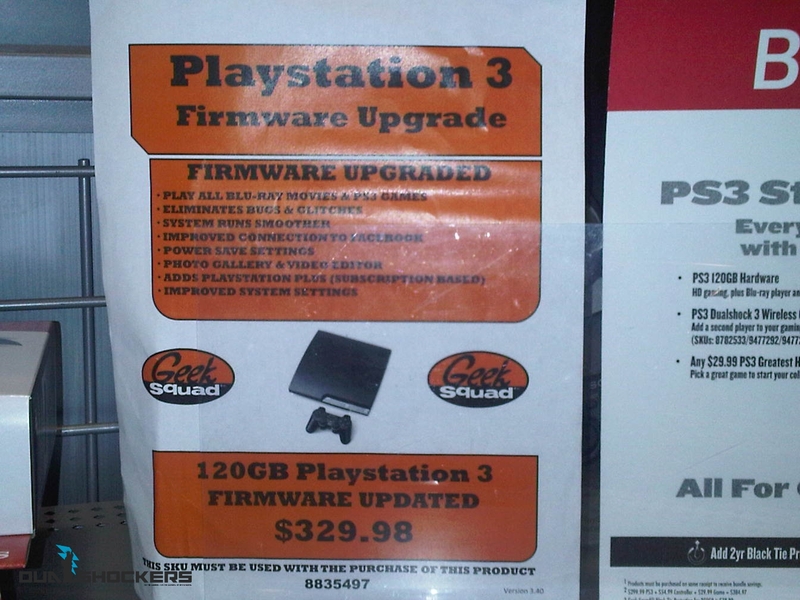 In what can only be described as a new low, Best Buy has decided to take advantage of uneducated PS3 consumers. They are now in the business of selling firmware upgrades to their clients, which unless something changed, are free for anyone with a wifi connection and take little to no effort. In case it is unclear I will break it down for you. Best Buy has the audacity to charge $329.98 for a 120 gb PS3 Slim, which normally will cost you $299.99. So what are you paying an extra $30 for? A firmware upgrade! A free one that is as simple to do as turning your PS3 on. Best Buy actually advertises it as “Eliminates Bugs and Glitches” and “Play All Blu-Ray Movies and Games.” This is beyond misleading to anyone who does not realize that is totally an unnecessary service. What do you think? I can’t believe they are getting away with this, I guess the old saying is true… there is a sucker born every second and Best Buy is inspecting their wallets. They did the exact same thing when NXE for the 360 came out. They opened them up, downloaded it, and sold them as new for $330. Greedy fuckers. $30, for someone to install the firmware update for you? Epzaos wrote: $30, for someone to install the firmware update for you? Well that's the thing, people buying it might not know that it's free, there are probably some people that bought it without realizing they have been ripped off. Kudos to them if people are actually stupid enough to buy it. Geek Squad are renowned for doing stuff like this, sad thing is that they get away with it. I believe they once had an advert offering to "install your ps3"...that means they would connect all the cables (hard work eh?) and do any updates and they were charing something like 39.99 for it. LMAO, Best Buy is trying to justify this. While many gamers can handle firmware upgrades easily on their own, those customers who do want help can get it from Geek Squad, and we continue to evaluate this offering to ensure it meets their needs. The service goes beyond a firmware updates, and includes user account setup, parental control setup and other components. I can see how they can take advantage of people who aren't gaming savvy. Epzaos wrote: LMAO, Best Buy is trying to justify this. This is why there is something called an instruction manual Best Buy, you fucks.